The following article by RW Carl Ek is reprinted from the July/August 2009 issue of The Connecticut Freemasons publication, which is running a series of articles celebrating the 20th anniversary of our mutual recognition. Read other articles in this series: 20 Years. Dateline: Cromwell, Connecticut, October 14, 1989. The Prince Hall Grand Lodge met in annual communication, and voted on the recognition resolution first. In the parlance of sports, the vote was a slamdunk, with only one member voting in the negative. With the requirement of ‘all or nothing,’ it was Prince Hall’s turn to wait to see if the A.F. & A.M. Grand Lodge would likewise approve mutual recognition at their special communication, being held at Sheehan High School in Wallingford. As it became clear that the special Prince Hall Recognition Committee chaired by Grand Senior Deacon Kenneth B. Hawkins, Sr., would report favorably on the plan, brothers who may not have been in favor carefully attempted to have influence on the decision. A Past Grand Master approached MW Gail N. Smith to suggest that given the magnitude of the proposed change, some brothers might desire a written, private ballot to express their feelings. Bro. Smith agreed that he was correct – thinking that some would use ‘privacy’ as an excuse to retain the status quo while not appearing to be racially motivated. Still, Grand Master Smith directed Grand Secretary and MWPGM R. Stanley Harrison to prepare paper ballots for the recognition vote – knowing that they would never be used. As some in Prince Hall Masonry feared being overwhelmed by the much larger A.F. & A.M. Grand Lodge, so some A.F. & A.M. Masons expressed a concern that their meetings might be visited by large groups of Prince Hall Masons. Why, others asked, would that be a problem? Lodges that ‘blitz’ might arrive unannounced at a visited lodge with 10, 20, even 30 members (and, politely, with a large quantity of refreshments). Why would a visit from a Prince Hall delegation make any difference to the visited lodge? Unless, of course, there were other, unspoken, considerations…. Then Senior Grand Warden of the Prince Hall Grand Lodge Michael Bivans focused on some of those concerns while speaking to Compass Lodge No. 9, Wallingford in the weeks leading up to the votes. RW Mike had been invited by Compass WM Charles Rogers to speak to his lodge to give a history of Prince Hall Masonry. After his formal presentation, Mike responded to a question about visitation between jurisdictions. “Do all of your (A.F.& A.M.) members show up at your meetings? Of course not,” Mike answered his own question, looking at vacant seats in the nearly full lodge room. “And do all of my (P.H.A.) members show up at all of our meetings? Same thing. So what makes anybody think that when we approve mutual recognition, all of ‘your’ members are going to start going to ‘our’ meetings, and all of ‘our’ members are going to going to start to ‘your’ meetings? Won’t happen,” he concluded. History has proven him correct. 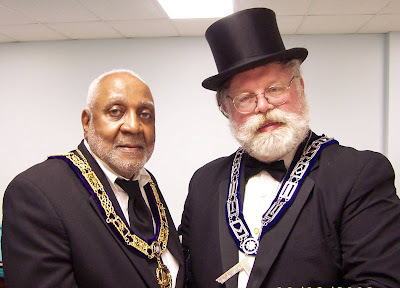 Image: MW Lew Myrick and RW Carl G. Ek, Worshipful Master. Unity Lodge No. 148, New Britain, at the Recognition Table Lodge. MW Myrick was protagonist for recognition twenty year ago, and RW Ek is the author of this series. Dateline: Wallingford, Connecticut, October 14, 1989. The Grand Lodge A.F. & A.M. special communication being held at Sheehan High School had several items on the agenda, most of which were disposed of as preludes to what everyone understood to be the main topic of business. Brothers learned about plans for the next inspection cycle and filled out a questionnaire concerning the then-Grand Lodge quarterly publication, Connecticut Square and Compasses. The questionnaires filled out and collected, Grand Master Gail Nelson Smith announced, “We will now take up the Prince Hall Recognition…” and stated that there could be no amendments to the resolution since it was the same resolution being acted upon – at the same time – by the Prince Hall Grand Lodge. After opening remarks, Bro. Smith asked subcommittee chairman Hawkins to read the recommendations of his group. Past Grand Master Morris I. Budkofsky, chairman of the Fraternal Relations Committee, reported complete satisfaction with the legitimacy of the Prince Hall Grand Lodge and recommended that approval of “Fraternal Recognition, including rights of visitation, be granted…” The original motion was reread and opportunities for remarks allowed. Grand Master Smith then asked those in favor of the resolution to stand, be counted, and those opposed to stand. The final tally was not recorded in the Grand Lodge Proceedings except to say that “a large majority” had approved the resolution at the historic communication of the Grand Lodge. Bro. Smith then reported – to great applause – the Prince Hall Grand Lodge’s vote of approval and concluded the agenda of his own session. Thereafter, Bros. Smith and Hawkins made a short drive to close a centuries-old gap in Masonic brotherhood, becoming the first A.F.& A.M. Masons to be formally received into the tiled Prince Hall Grand Lodge session. Joint news releases would spread word of the good work publicly, but the pre-Internet Masonic grapevine spread the word faster, that recognition was reality. Response would be rapid….